It is time for kids to go Back To School. 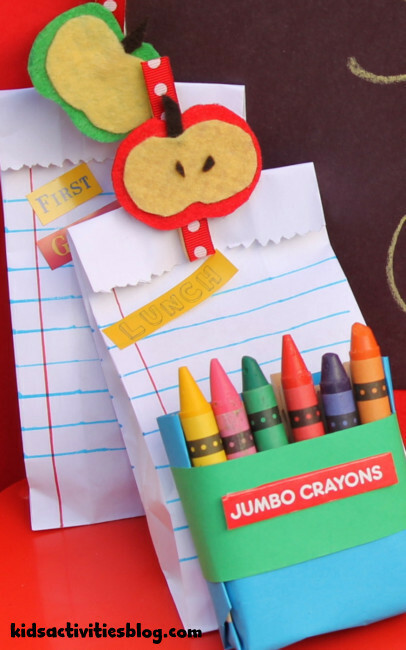 Here is a fun craft made with crayons that you can make with your kids to help celebrate going back to the classroom. My children get crayon boxes as gifts all the time so we have our fair share of coloring supplies. I made tons of these crayon clothes pins to use as a Back to School Banner, for our kids first week of school so I was trying to figure out how to repurpose them. It’s easy and cute enough to give as a gift. Just place them in the “crayon box” and tie a ribbon around it. I just love how these turned out! Note- If you use jumbo crayons you will need thick magnets to keep them from sliding down the fridge. 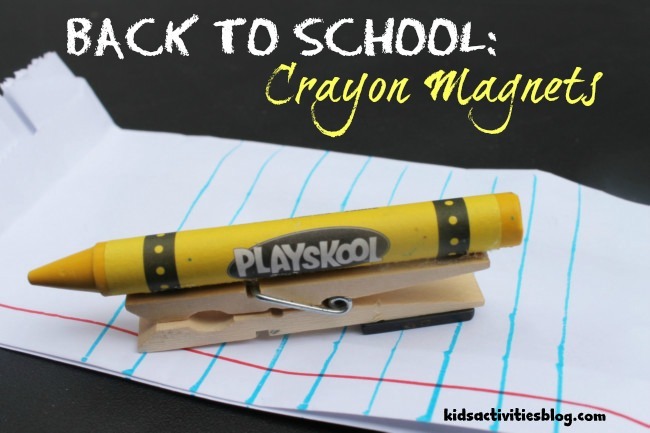 Glue crayon on clothespin and then glue the magnet to the back of the clothespin. Melted Crayon Art – Crayons melt and make beautiful and colorful pieces of art. Decorate A Neck Tie – Your child can use crayons to make art work that you can then transfer to Dad’s tie. Actually, this process could be used on other pieces of clothing like t-shirts and tote bags. Matching Game with Textures – You can make this fun game by making crayon rubbings from items in your home and then letting your child hunt around the house for the household items that match the crayon rubbing. What a fun scavenger hunt! These are super cute and so easy to make! Kim, Thanks, I am loving using them.